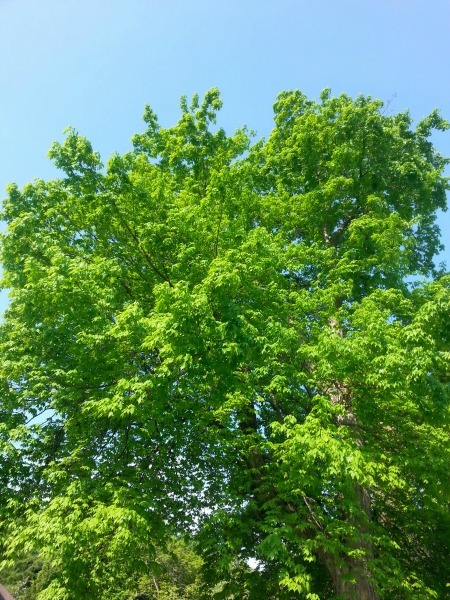 Have you ever noticed how many different shades of green there are, especially in Springtime? One recent day, I tried — unsuccessfully — to persuade Dallas to take a long walkie with me and ultimately opted to go by myself…with camera in hand, of course. The temperature was around 60 degrees. The sun was shining. The winds were calm. And I covered several miles before my Puritan Muse insisted I get back home and do some work! 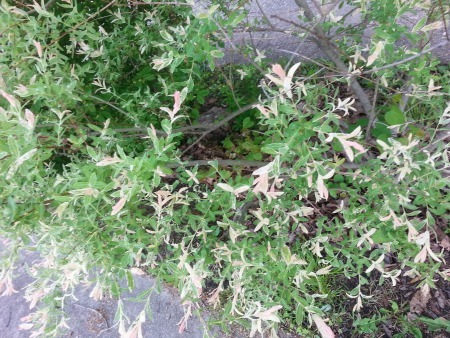 2) This odd bush had pinkish tips among pale green. 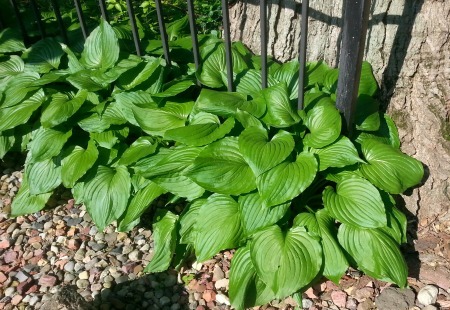 3) Hostas along a wrought-iron fence. 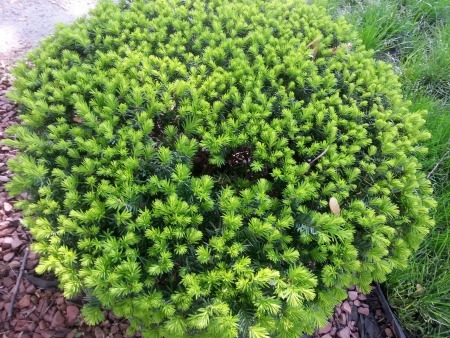 4) New bright green growth on this bush. 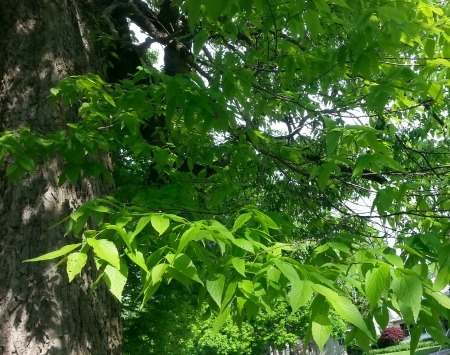 6) Tree showing its new leaves. 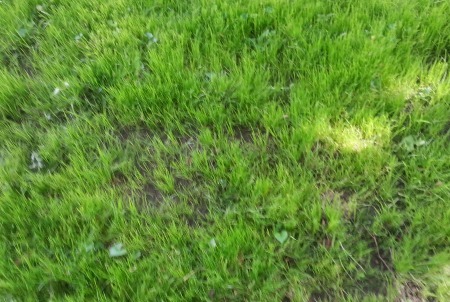 7) Looks like somebody seeded for new grass in this spot. 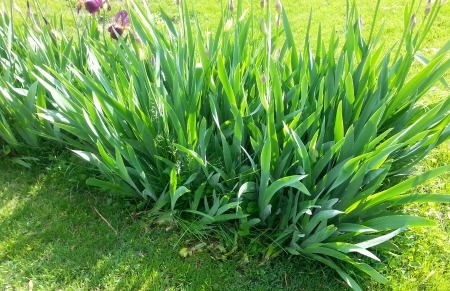 9) These purple Iris flowers have spiky green leaves. 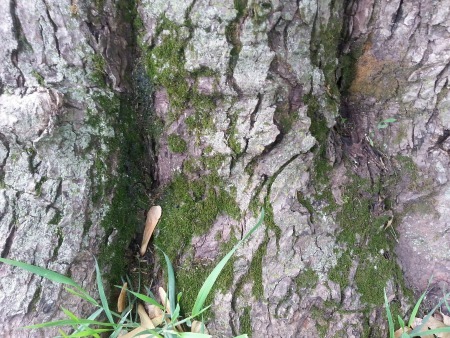 10) Dark green moss growing on the north side of this Maple tree. 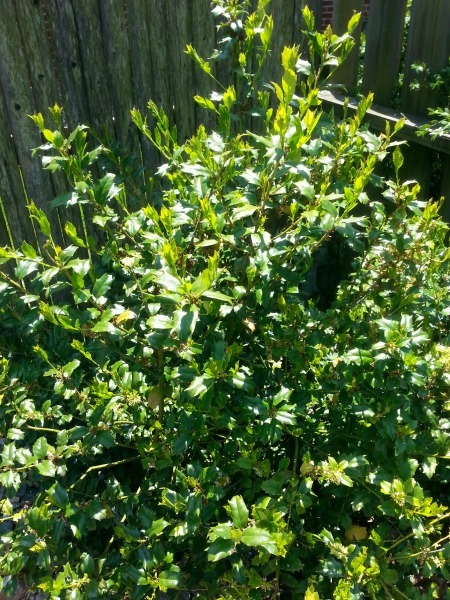 11) Holly won’t have bright red berries until much later in the year. 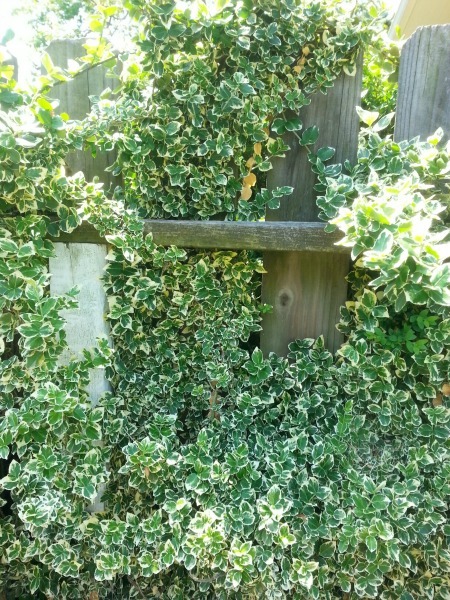 12) Some kind of creeping variegated thing growing along a rustic wooden fence. This entry was posted in Seasonal and tagged grass, holly, Hostas, moss, pine, Spring foliage. Bookmark the permalink. More lovely, lovely green! That last picture there made me catch my breath – it looks exactly like a spot at the end of my garden!! I thought you may have wandered there and not stopped by for a cup of tea! The plant with the pink-ish tips is very familiar, I have definitely seen that beast before. Green is such a tactile colour, isn’t it? I want to stroke all of these lovely things! Your garden? Seriously? Oh, this is too much! I really fell in love with the way this vine looked on this wooden fence. Hearing that you get to see something very much like it every day is fabulous!! And I so love your description of green as being “tactile.” I’d never thought of it that way, and now I shall!! Yes, it really does!! I know, I am very lucky to be surrounded by such beautiful things. I love it when nature takes over. It certainly is tactile! So strokable… like Dallas! You’re right! I hadn’t thought of it that way. Of course, the lovely vine doesn’t demand to be stroked the way the spoiled doggin does! Green is super. But I say, we need some red grass, I think. Your avatar is looking very professorish…and musical, Professor — nice to see you, sir! Red grass, hmm? Well, not here in the Midwest. But, just because you’re so very eager for something red, I’ll look around and try to find red things to photograph…just for you! You will? Gee. That’d be awesome. After all, red is the best, you know. haha, thanks! Musical too? I can dig that. And a Top o’ the Morning to you, too! These photos are lovely. I especially like the last one. Winding vines can be so pretty and those seem so lush. Thanks for sharing! Why, thank you, Monica! Yes, I was a bit surprised that creeping vine came out as pretty as it did. I was afraid the sun angle wasn’t the best. The contrast with the wooden fence helped, I guess! Thanks so much, Morgan! If I were a “real” poet instead of just a hack, I’d have taken a few of these photos and put descriptive words to them. Sigh. Of course, I can always blame it on lack of time…or laziness!! What a nice thing to say! And thanks for letting me off the hook!! Lovely pics, Debbie! So many different variations of “green”! I know! It’s like trying to match a navy blue piece of clothing — who knew there were so many variations?! Green is my favorite color. Gorgeous photos, Debbie! Really? I love green, too (probably that Irish coming out!) Thanks for reading and I’m glad you enjoyed them. Loved the greens, Debbie. So beautiful. Thanks for taking me on the stroll. Yes, get back to work. Glad to have you join me, John! ‘Tis soooo hard to work when the sun’s out and the greens are beckoning!! GLORIOUS selection of my FAVORITE color, Debbie! I LOOOOOOOOOVE green! It’s both a calming yet, energizing color. There is also something very healing to me about the color green. And speaking of green, I spent yesterday (one of my days off) outside in the warm sun, enjoying all the greenery around me. Your pictures are absolutely beautiful! The third one down (Hostas) are my personal favorite green leaf. We have them here in Philly in many of the parks. Such a gorgeously rich green! Love that last photograph of the ivy. Isn’t natural grand? Thanks so much for sharing the beauty, my friend. Hope you’re having a fantastic week! Green is calming, isn’t it? Maybe that’s why I find so much peace on a golf course or a tennis court, because of all the green! Your day yesterday sounds delightful. Sadly, we’ve had nothing for the longest time but rain, rain, and more rain — making everything GREEN, of course, but not letting anybody but the bravest few experience it except from inside! And don’t get me started on how difficult it is having a long-haired dog in all this moisture! You’re so right — the variety of greens in spring can be breathtaking. 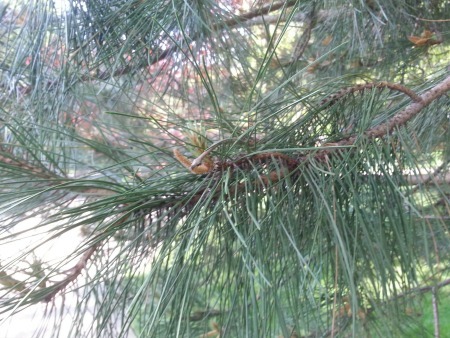 I especially like the baby needles on the cypress. When they first appear, you hardly can see them as individuals. There’s just a sort of greenish haze around the tree. And then, in a couple of days (or even overnight, it seems) they show their growth. I’m really intrigued by the hostas. I don’t remember them from growing up, and I’m not sure they grow down here, but they’re beautiful. And speaking of green — that golf course you have as a background doesn’t do too badly in the green department! It seems like everybody has hostas here. 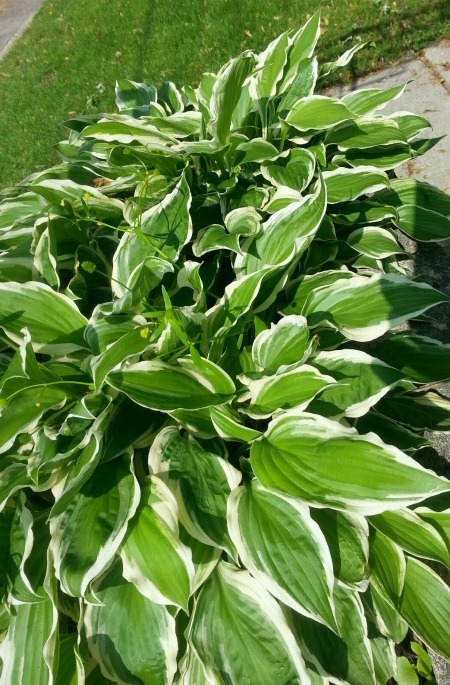 I think their relative hardiness must contribute to their popularity (http://www.gardeningknowhow.com/ornamental/foliage/hosta/growing-hosta-plants.htm). We used to have lots of them until the slugs became bothersome — wish I’d known about the sand before we had them all removed! They put out a delicate purple or white flower, too. So many shades of green; absolutely marvelous! How can one not be energized out in the lush of nature? Thanks, Suzi — glad you enjoyed them, too! There’s something so restful and calming about green, isn’t there? Ah – green is my favorite earth tone! Thank you for sharing this life giving color. I’ve been in Oregon for 3 1/2 years now, having moved here from Colorado and I’ve never been in such a green place. I love it and am soaking it in every chance I get. I’ve never been to Oregon, but I’ve always heard of its greenness (probably because of all the rain!). I can imagine such beauty would be truly inspirational for a creative person!